A front page spread for a chaotic Rag Ball event starring The Kinks and the Honeycombs ('Have I The Right?'). Both acts were forced to leave the stage due to bottle being thrown by the crowd. One of the Kinks' microphones was damaged (costing £30) and sugar was poured in the petrol tank of their car. 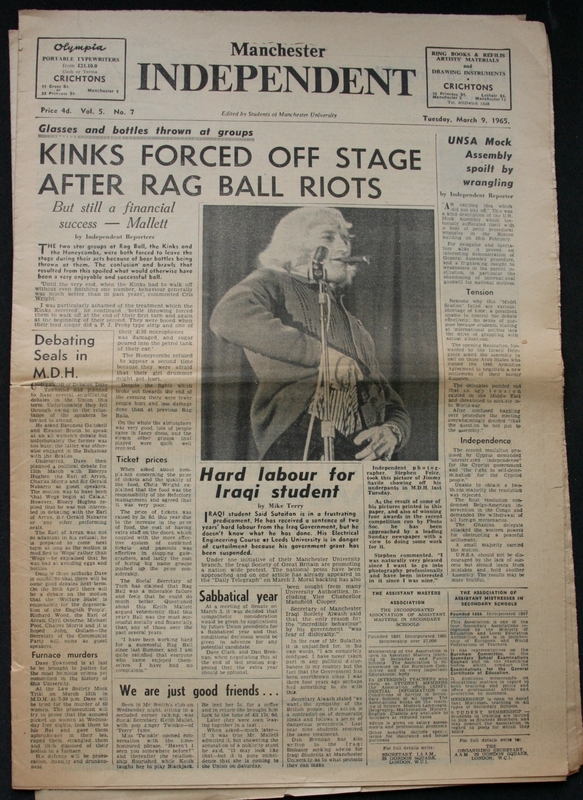 The article states that despite the fights which broke out towards the end of the evening 'there were fewer people hurt and less damage down than at the previous Rag Ball'. Keith Mallet - the Social Secretary - is keen to point out that the Ball was very successful financially, whilst the Social Secretary of the Tech Union (UMIST) claims the Ball was a 'miserable failure' and that he could do better. This hints at the rivalry that existed between organisers of 'Tech Social' events at the College of Technology Students' Union at North Campus and the main Union (Oxford Road). The following year (1966) the College of Technology was renamed the University of Manchester Institute of Science and Technology (UMIST), and Tech Socials, as they were known, were moved the new Barnes Wallis building at the North Campus, off Sackville Street. You can read more about the relationship between UMIST and Victoria University (now merged to become the University of Manchester) below.